When making a purchase I like to explore the market to ensure I am getting a good deal that will deliver my expectations from a brand that I can trust and build a relationship with. 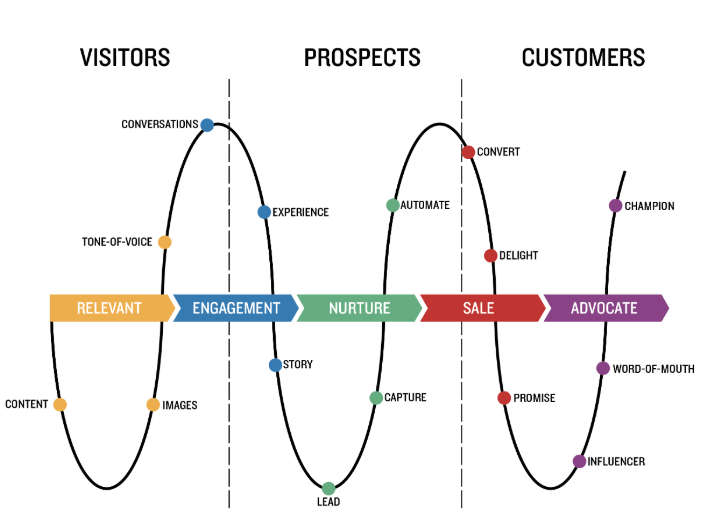 This is what your customers want too. 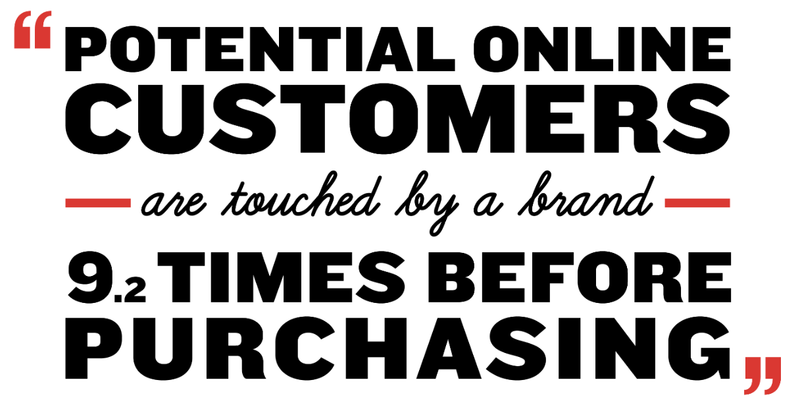 It is very unlikely that people will instantly become customers as soon as they land on your page. In fact, up to 98% of first-time website visitors don’t convert on their first visit to a website. Of course, this means you need to bring these customers back, once, twice or multiple times, whatever it takes to make them more likely to convert. This is aptly referred to as retargeting. Facebook is a great way to retarget potential customers and businesses need to get involved with social media if they want to see an improvement to their bottom line. 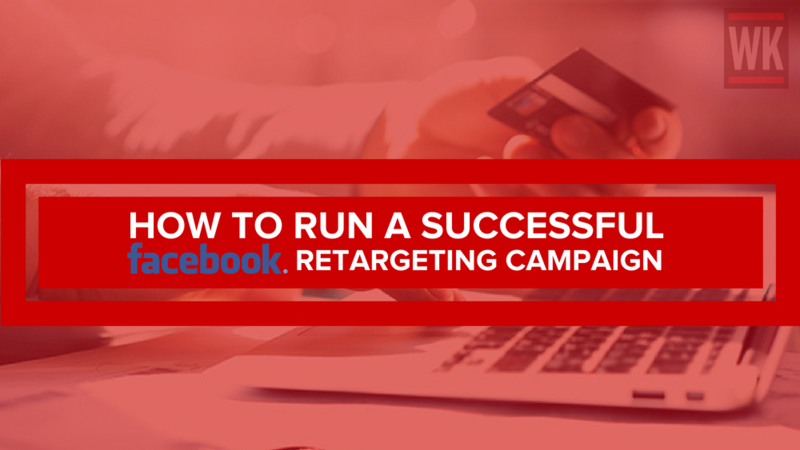 What we mean by retargeting ads is simply that- you are retargeting your ads to those that have already engaged with your brand but didn’t convert initially. It means your target audience is those people who have previously interacted with you. Your ads are specifically targeted to potential consumers through cookies. Facebook allows you to go further than just those that have landed on your website. It collects data from the users who have watched your videos, visited your app or those subscribed to an email list. There are many benefits of retargeting ads, the main one is of course the chance to increase your bottom line from potential customers. Those who revisit your website after viewing retargeted ads are 70% more likely to convert than on the first visit, with the ads being 76% more likely to be clicked on than regular ones. The pixel is a small piece of code that you can install on each page of your website. This tracks who is visiting your website and collects data allowing you to retarget them with adverts. This can be found on your Business Manager within Facebook in the far-right column under Pixels. Then click on the green Create a Pixel button at the bottom of the screen. Once your pixel has been created, you need to copy and paste it into the <head> tag of each page on your website. 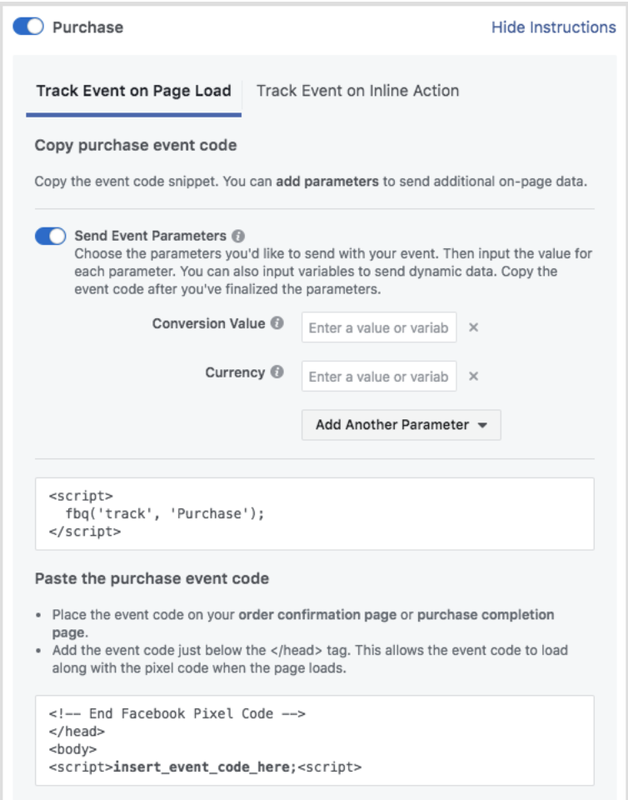 To make sure that you are monitoring how successful your ads are, you can add the Initiate Purchase snippet to the basket page of your website and the Make Purchase code to the ‘thank-you for your order’ page. This line of code needs to be added along with the base code, not instead. You can also set up a ‘product catalogue’ which is found on the Business Manager on Facebook, which means ads will bring back images of products that potential customers have already viewed on your website. 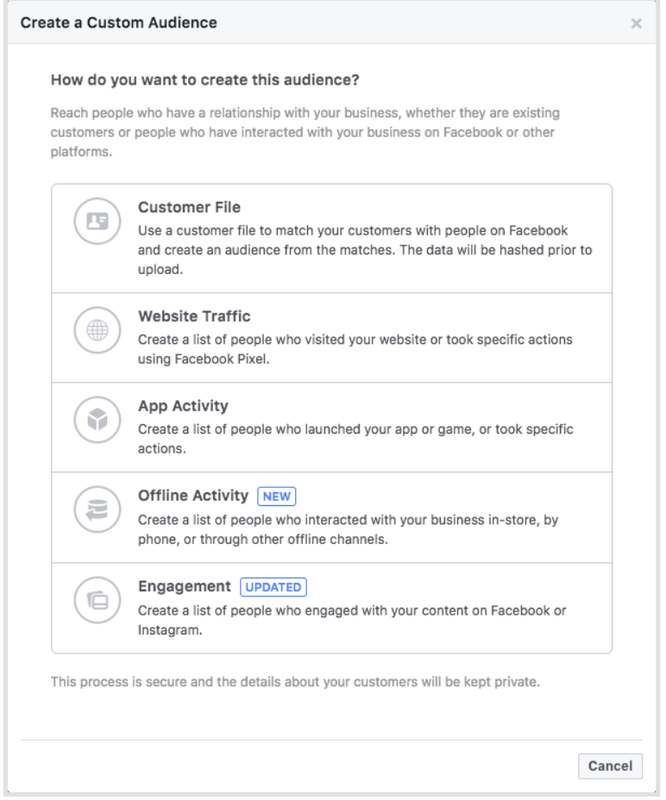 First you will need to set up your ‘Custom Audience’. This is effectively the data that has been gathered by your Facebook Pixel. This can be done by selecting the Audiences tab on the Business Manager, under the Assets column. To create a website retargeting audience, you will need to select Website Traffic. From here you can customize the settings to suit how you would like to run your campaign. You don’t want to be bombarding people with your ads for months on end, it will start to get boring and become a nuisance ad. To ensure this doesn’t happen, set a sensible day limit on your custom audience. This way your ads will only target those who have recently visited your website. 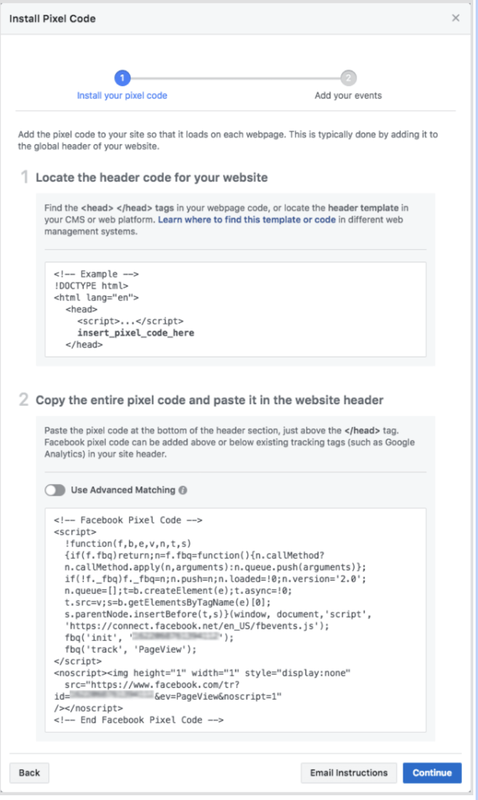 As I mentioned earlier in relation to the Facebook Pixel’s additional code, it is important to target people that visit specific pages. This means that you get more of an idea of how likely they are to convert in the future according to the pages they have visited. This way you can personalise your ads, so it stands out from all the others that are shown daily. It also means you are able to tailor your ads further in order to get the conversions you desire. Similar to segmenting your audience, you need to make sure you are not targeting those who have already converted with the same purchase. If they have bought something from your website, the likelihood is they won’t want to buy the exact same thing again. It will annoy your customers and make them less likely to spend with you again in the future. Again, you don’t want to bombard people with your ads every time they unlock their phone or open Facebook, just like you don’t want your ad to follow them for the next year. To make sure this doesn’t happen, utilize the frequency capping option. It is important to find the balance between making your ads appear enough to be noticed, but not too much that potential customers never want to see your brand on their screen again. In a nutshell it stops your ads coming across as spam to the audience. You may want to use the Daily Unique Reach feature if you have a small audience for your retargeting ads. This is because you will reach your entire audience rapidly if you are optimizing towards link clicks and website conversions, which affects the longevity of your campaign. The Daily Unique Reach feature means your ads will only be shown to your audience once a day, decreasing the nuisance factor they may start to have if shown to a few people very frequently. It is also important to continue utilising frequency, so only select this feature to use with people that have recently visited your website. Switch up the images and text you are using in your creatives. We live in a visual world, where the pictures you use draw your audience in. It is the first thing they see and needs to be vibrant and relevant, so make sure you are not repeating the same old creative. There was a reason that potential customer didn’t initially convert. You need to make sure this reason was not something you could avoid. By removing all the clutter from your landing pages and ensuring the information present is relevant, simple and easy to digest – without being boring – your customer is not being put off by unnecessary things. While you’re at it, make sure your mobile site is also optimized. A page that takes longer than three seconds to load could mean your forfeit half of your traffic. When creating your custom audiences in Business Manager ready for your retargeting campaign, upload your list of email subscribers. These people are already familiar with your brand and they have personally requested to be notified of specific events and deals you have to offer. They are primed and ready to convert- you just need to give them that extra push. These people trust your brand. They have already converted so you are past the first hurdle. Now it’s time to build that loyalty and keep them coming back. Analyse past trends on your website, look at who has bought certain products together and target customers that have purchased one but not the other. If you are promoting a recurring event, then you already have a captive audience- use it! Retarget them to so they reattend. There are many ways to reach your customers online and offline, so you need to be making each one count in a bid to get those conversions. Those first few impressions are important in whatever you are doing, but they are imperative if you want to get those precious conversions. The initial meeting with the potential customer must have gone well to have them landing on your website, and even better if they started purchasing, but for some reason didn’t finish. Now, having a relevant retargeting campaign is what is going to ensure these customers will be coming back and converting. It is important to have a relevant and consistent tone-of-voice in your ads, but there is room to become more conversational. As they are already familiar with your brand, you can manipulate your ads to create more rapport with the customer and therefor increase engagement. Using Facebook to help with your remarking also lends a hand to this as the platform is inherently social. Remarketing is one part of an overall digital marketing strategy. This strategy includes organic reach, through content writing and social media marketing, along with push marketing such as, pop-ups and of course, email marketing. As well as this, I work with my referral network of partnerships which all link back to one specific landing page on my website. This is where the remarketing works its magic to drive visitors into becoming loyal customers and advocates of my brand. How are you going to utilise remarketing in your future campaigns after reading this blog? Is there anything you’d add to ensure success?